He was born in Vorau, Austria and completed his studies of music at the University of Arts and Music in Graz. 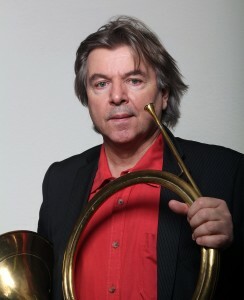 Besides master classes with Thomas Müller-Basel, Philipp Jones-Luzern-London, he gained extensive orchestra experience as principal hornist in the NÖ Tonkünstlerorchester, as well as with the Wr. Philharmoniker, the RSO Wien, etc. He is principal horn player of the Wiener Akademie, Musica Angelica Los Angeles, L’Orfeo Barockorchester, Les Musiciens du Louvre Grenoble. Several composers dedicated works to him, for example Oddvar Lönner, Georg Aranyi-Aschner. Teaching at the University of Arts and Music Graz, Institut Oberschützen, soloist activities and records with the Wr.Kammerorchester, the RSO Krakau, the Haydn Akademie or the Mozarteum Orchester Salzburg, and publications, e.g. “Die Hornisten Joseph Haydns am Hofe Esterhazy“ belong to his assignments.